Through your GrowthZone software, you can sync contacts in your Lists/Committees to Constant Contact. Any additions, changes or deletions made to lists/committees that you have set to Synchronize Contacts with authorized third party newsletter solution will synchronize to Constant Contact near real-time. See Setting Up Lists/Committees for information on configuring your lists/committees to synchronize to a third party newsletter. Click Constant Contact in the Integrations section. Enter your credentials for Constant Contact, and click Log-in. Click Allow on the Allow Access screen. This process authorizes the connection between GrowthZone and Constant Contact. 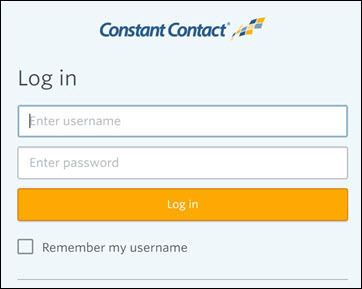 Once completed, you will see the ConstantContact status updated to Connected. After initial connection, click the Sync button. This will synchronize all of your existing lists/committees, that are set to you Synchronize Contacts with authorized third party newsletter solution, with Constant contact. NOTE: Only contacts with a default/primary email address and where Do Not Contact is not enabled, will be synchronized to Constant Contact. A new List/Committee is added to GrowthZone with “Synchronize contacts with authorized third party newsletter” set: The new list/committee is added to Constant Contact. The “Do Not Contact” check-box is set for an existing contact in the List/Committee within GrowthZone: The existing contact is disabled in Constant Contact, and removed from the list/committee in Constant Contact. The "Do Not Contact" check-box is cleared for an existing contact in the List/Committee within GrowthZone: If the contact, that would previously have been disabled in Constant Contact, is re-enabled. An existing contact's name and/or default email address is changed (and the contact belongs to the List/Committee synched to Constant Contact): The updated contact information is sent to Constant Contact. An existing contact is removed from a List/Committee in GrowthZone: The contact is removed from the List/Committee in Constant Contact. If the contact is not a part of other lists, the contact is disabled. If a List/Committee is deleted from GrowthZone: The List/Committee is deleted from Constant Contact. If there are contacts in the Lists/Committees, and those contacts belong to no other Lists/Committees, they are disabled in Constant Contact. A contact who is in multiple Lists/Committees in GrowthZone is deleted from GrowthZone: The contact is deactivated in Constant Contact. 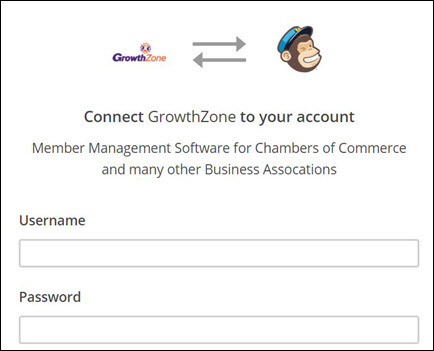 Through your GrowthZone software, you can sync contacts in your Lists/Committees to Mail Chimp. Any additions, changes or deletions made to lists/committees that you have set to Synchronize Contacts with authorized third party newsletter solution will synchronize to Mail Chimp near real-time. See Setting Up Lists/Committees for information on configuring your lists/committees to synchronize to a third party newsletter. Click Mail Chimp in the Integrations section. Enter your credentials for Mail Chimp, and click Log-in. Connection status will show Connected and your Organization Contact Information will be displayed. After initial connection, click the Sync button. This will synchronize all of your existing lists/committees, that are set to you Synchronize Contacts with authorized third party newsletter solution, with Mail Chimp. NOTE: Only contacts with a default/primary email address and where Do Not Contact is not enabled, will be synchronized to Mail Chimp. A new List/Committee is added to GrowthZone with “Synchronize contacts with authorized third party newsletter” set: The new list/committee is added to Mail Chimp. A new contact (with valid default/primary email address) is added to the List/Committee in GrowthZone: The new contact is added within that group in Mail Chimp. 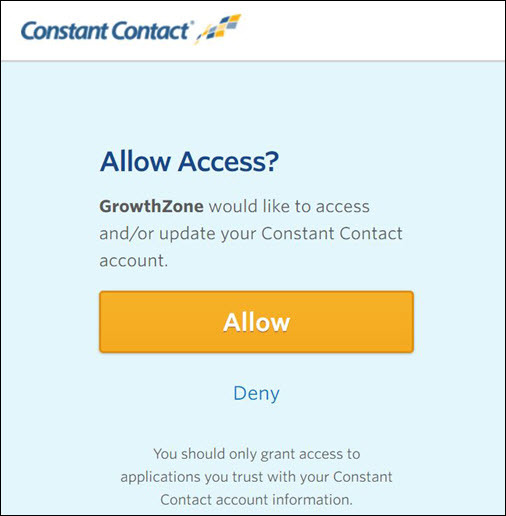 A new contact (with valid default/primary email address) is added to the List/Committee in GrowthZone with Do Not Contact set: The new contact is NOT synchronized to Mail Chimp. The “Do Not Contact” check-box is set for an existing contact in the List/Committee within GrowthZone: The existing contact is unsubscribed in Mail Chimp, and removed from the list/committee in Mail Chimp. The "Do Not Contact" check-box is cleared for an existing contact in the List/Committee within GrowthZone: If the contact, that would previously have been disabled in Mail Chimp, is re-enabled. 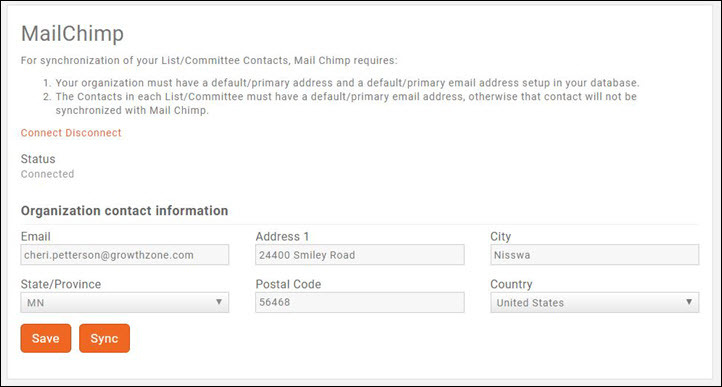 An existing contact's name and/or default email address is changed (and the contact belongs to the List/Committee synched to Mail Chimp): The updated contact information is sent to Mail Chimp. An existing contact is removed from a List/Committee in GrowthZone: The contact is removed from the List/Committee in Mail Chimp. If the contact is not a part of other lists, the contact is disabled. If a List/Committee is deleted from GrowthZone: The List/Committee is deleted from Mail Chimp. If there are contacts in the Lists/Committees, and those contacts belong to no other Lists/Committees, they are disabled in Mail Chimp. A contact who is in multiple Lists/Committees in GrowthZone is deleted from GrowthZone: The contact is deactivated in Mail Chimp. NOTE: If a user unsubscribes from a list via MailChimp, Do Not Contact will be set for the contact on that list in GrowthZone. The integration between the GrowthZone AMS and your Higher Logic Community site drives object creation in the community from the vast amount of up to date member data that you already track in the GrowthZone AMS. The integration ensures that your members interact with the most up to date member data, boosting member participation, collaboration and retention. Through your GrowthZone software you can sync your lists/committees to Higher Logic. Higher Logic is an industry leader in cloud-based community platforms. Organizations worldwide use Higher Logic to bring people all together, by giving their community a home where they can interact, share ideas, answer questions and stay connected. After the integration is in place, it is not necessary to complete any additional work to ensure that the data reflected on your community site remains synchronized with the GrowthZone AMS. GrowthZone uses Higher Logic's Push API Integration methodology. This type of integration allows GrowthZone to send updates directly to Higher Logic. To authenticate with Higher Logic an API Gateway Key and Tenant Code are needed for the Push API method. The API Gateway Key is generated by Higher Logic and the Tenant Code is specific to the client’s Higher Logic’s instance. The Tenant Code is generated by Higher Logic, and is entered into GrowthZone in the Higher Logic integration settings. Click Here for Higher Logic documentation on integration. Please contact support@higherlogic.com and ask for an API key that can be used to integrate your GrowthZone account. If you are just starting with Higher Logic, mention this integration to your Higher Logic Account Manager and he will give you this key. NOTE: Individuals are pushed to Higher Logic, not organizations. When setting up lists/committees for synchronization to Higher Logic, ensure that individual contacts are added to the list/committee not a business/organization. Only the records of Active members associated to groups for which the Synchronize Contacts with authorized third party newsletter solution is enabled will be pushed to Higher Logic. Click Here for information on configuring groups to synchronize to a third party. Higher Logic refers to lists/committees as Communities. If a new list/committee is pushed to Higher Logic, Higher Logic will automatically create the community, however it will be hidden. These communities will require further configuration in Higher Logic for the correct use, but they will not need to be created. A Higher Logic user with administrative rights would need to access the communities area, configure the community appropriately and un-hide it. Click Here for Higher Logic documentation on managing communities. Select Higher Logic in the Integrations section. This will open the Higher Logic Integration dialog box. Enter the Tenant Code provided by Higher Logic. Once the integration settings have been saved, click the Sync button. This will synchronize all of the lists/committees for which you have enabled Synchronize Contacts with authorized third party newsletter solution to Higher Logic. NOTE: If you plan on using Single Sign-on, it is important that you do this initial synchronization prior to enabling single sign-on. This ensures that Higher Logic has a record of the users who are attempting to access Higher Logic from the Info Hub. After initial synchronization, the system will look for additions, changes, and deletions from list/committees that are set to synchronize with Higher Logic and push these changes to Higher Logic within 30 minutes. As access to Higher Logic is intended to be a member benefit, only Active members in the lists/committees will be pushed over to Higher Logic. Within the Higher Logic an Edit Profile option is available. When this option is selected, the member is re-directed to the GrowthZone Info Hub to update information. This ensures that GrowthZone, the system of record, is accurately updated. NOTE: The List/Committee Setting Do Not Contact has no impact on synchronization for Higher Logic. Higher Logic is used as a community forum, not for email purposes. GrowthZone AMS’s API provides a seamless Web experience across the GrowthZone AMS and other third-party systems. It allows users to login to your Info Hub (Members Only Area) and gain secure access to all related Web sites, including your Higher Logic Community using the same login credentials they would use with the GrowthZone AMS Info Hub. Single Sign-On (SSO) is accomplished by using GrowthZone’s implementation of OAuth 2.0, an industry-standard protocol for authorization. NOTE: You must complete the Higher Logic Integration setup prior to setting up Single Sign On. Your members will not be able to sign in if the integration has not been setup. Click the Show Single Sign-On link in the Info Hub check-box. Link to HigherLogic Community Site: This is automatically populated and should be the URL for your Higher Logic site. Best practice is to verify that this link is correct. Optional Custom Term for Community Link: You can customize the Info Hub link, by default the link is named Community. Optional Custom Icon for Community Link: (Optional) You may enter a a Font Awesome icon to be displayed on the navigation panel for this item in the Info Hub. Visit the Font Awesome website. The icons you choose must be for supported FREE icons version 5.0.12 or less. The first time a member clicks the Community (or the terminology you have configured) link in the Info Hub, an authorization page will be displayed. The member must click the Grant button to access Higher Logic. The next time the member accesses Higher Logic, the member will automatically be logged in. NOTE: Only Active members, assigned to lists/committees that are synchronized to Higher Logic will be able to access Higher Logic. If a member is dropped, or removed from a list/committee they will no longer be able to access Higher Logic. Voter Voice is a third-party advocacy and lobbying platform. When enabled and linked, Growthzone provides a nightly sync of contact information to Voter Voice, updating records in Voter Voice to reflect changes made in Growthzone. The sync in GrowthZone will batch Active and Courtesy Member contact records and send them to the Voter Voice customer tenant nightly at 00:00 UTC; This is also a one-way sync/push, you should update the contact record in GrowthZone and let it push to Voter Voice. Select Voter Voice in the Integrations section. Click the Is Enabled check-box. Enter the Voter Voice API Key. You must contact Voter Voice to receive this key. Enter the Voter Voice List Name. . The default list name is “Default List”. The can find this in the Voter Voice admin panel. To simplify the process of uploading member changes to the National Association of Home Builders (NAHB) through WMS, we have integrated the required fields into various areas within the GrowthZone system and provided an export tool will allow you to pull monthly data quickly and easily. This process is only for HBAs that import monthly updates into NAHB. As of 12/2018 - this feature is in BETA. Please report bugs promptly and share feedback on how to improve the export process. Click WMS in the Integrations section. Select the desired Month and Year. NOTE: The exports are not batches so previously exported record from the same month will not be excluded. Click Run. A green success notification will be displayed in the upper right-hand corner of the screen. The generated file will be available in the Cloud. Click Cloud in the left-hand navigation panel. You can download the file from the cloud to make it available for import into WMS. See Downloading Documents from the Cloud for instructions. NOTE: While the export file may be edited, it is recommended that, if incorrect or missing data is identified in the file, that the staff user edit the contact record and re-export after the changes are saved. A Validation Errors column will be displayed in the output file, as shown in the image below. Most errors you may encounter are missing or incomplete data. HBA Number Account Number for your organization. Displayed beneath the name of your organization on your contact page. MSN* Membership Number. This number is provided by NAHB and may be populated on the contact profile tab, when clicking the membership displayed in the Membership section. Anniversary Date* Expiration Date. This field may be viewed/edited when clicking into the Membership on the profile tab, then clicking into the Membership Type in Membership History. Company ID* Organization Account Number. This field may be populated/viewed under the name of the organization on the contact page. The company ID is provided by NAHB/WMS for this member after they sign up for membership. Primary Activity Code Custom field. Custom fields are located on the contacts More Info tab. Primary Activity Other Description Custom field. Custom fields are located on the contacts More Info tab. These codes are defined by NAHB. Secondary Activity Code Custom field. Custom fields are located on the contacts More Info tab. These codes are defined by NAHB. Tertiary Activity Code Custom field. Custom fields are located on the contacts More Info tab. These codes are defined by NAHB. Number of Employees Custom field. Custom fields are located on the contacts More Info tab. Dollar Volume Custom field. Custom fields are located on the contacts More Info tab. Number of Units Started Custom field. Custom fields are located on the contacts More Info tab. PIN* Individual Account Number. This field may be populated/viewed under the name of the individual on the contact’s page. This is an NAHB/WMS generated representative ID. First Name* Individual Contact’s first name. The GrowthZone integration with the National Association or REALTORS’ NRDS database provides association staff an easy way to manage their contacts’ NRDS data. The current integration (April 2019) pushes data entered or changed in GrowthZone to NRDS, thereby updating agent and office records in NRDS within minutes of saving the changes in GrowthZone. Click National Association of Realtors Edition Settings in the Integrations section. On this screen you can set the account number field displayed under each contact’s name to automatically use the NRDS number (recommended). This means if the NRDS number is changed in either the account number field or on the Real Estate tab, it will automatically update the number stored in the other spot. Using the GrowthZone APIs is a way to easily integrate your GrowthZone data into other systems. Examples may include incorporating content like directories, events, etc. into a CMS, creating an SSO with your website or another application, or tying a mobile app to your GrowthZonedatabase. The API is a standard REST-based API with the ability to access many areas of the software. Click Here to view a full list of available GrowthZone APIs. GrowthZone's APIs are under active development and changes or additions can occur. This documentation is updated regularly and always represents the current state. APIs in GrowthZone are broadly organized by areas of use (i.e. modules). NOTE: In order to begin making calls to GrowthZone, you will need to first have API access enabled in your tenant and obtain an API Client ID and Secret. For authentication options, we currently support standard oAuth2 flows and SAML. If you have questions or need help regarding API authentication, integration or support, please call 800.825.9171 or email support@growthzone.com. This page was last modified on 11 April 2019, at 10:35.